I haven't really felt any particular inclination or need to purchase an eyeshadow palette in quite some time since I'm not a regular wearer of eyeshadow and even when I do, I tend to stick with a few tried and true shades. That may sound like blasphemy coming from someone who writes about beauty products but the truth is I'm the practical sort who doesn't like to waste money and one of my main issues with most palettes is that there is almost always a shade or two in there that you're never going to wear. 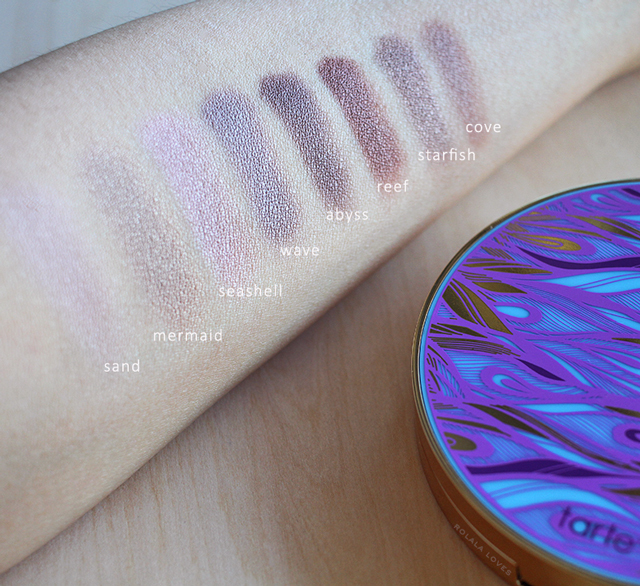 I pretty much stopped even looking at any for awhile until I came upon the Tarte Rainforest of the Sea Eyeshadow Palette. It appealed to me because all the shades look wearable and I was able to get it for 30% off during a Tarte sale. So this is my first eyeshadow palette purchase in about four years and I'm actually excited about it. 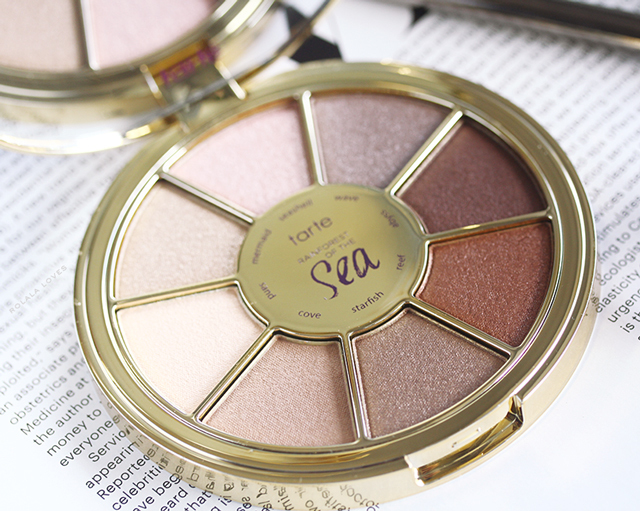 Tarte Rainforest of the Sea Eyeshadow Palette ($36.00) is a limited-edition palette with eight eyeshadows in neutral toned shadows. This palette features a new Rainforest of the Sea™ Complex, a proprietary blend of algae and marine flower extracts that help to reduce the appearance of fine lines and wrinkles while smoothing and softening skin. This highly pigmented and blendable cream to powder formulation hydrates and balances without ever feeling dry or chalky. 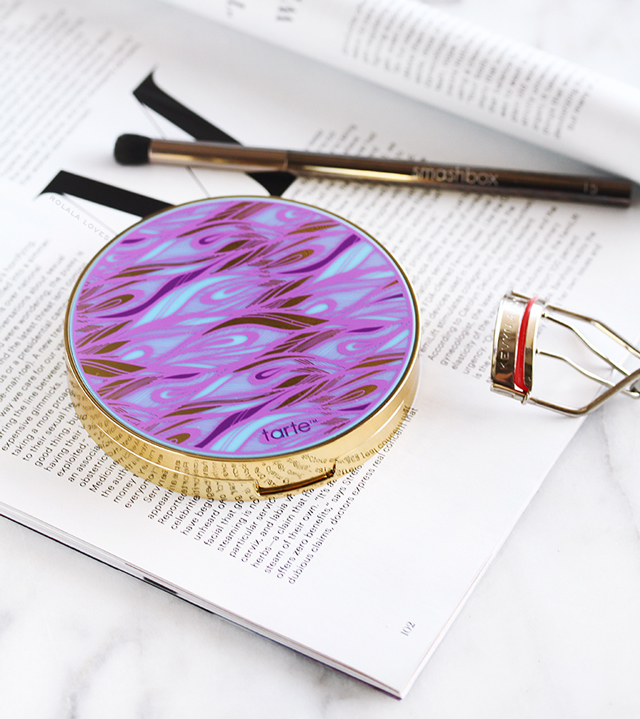 As with all Tarte products, this product is vegan and free of parabens, mineral oil, phthalates, triclosan, sodium lauryl sulfate and gluten. The eight shadows include a mix of warm and cool, matte and shimmer shades that are flattering across a range of skintones as well as suitable for everyday wear. I swatched these without primer to show the depth of coverage and pigmentation on bare skin. This palette features a range of versatile, neutral shades that can easily be used to create looks for both day or night. The shadows themselves are easy to work with, buildable and have fantastic pigmentation. These really are some of the creamiest eyeshadows I've used in awhile and that buttery texture means that they can easily be used with or without primer. I'm able to get a solid 8 hours of wear sans primer without much fading or falloff. Of course it wears even better with primer and is easy to remove at the end of the day. And I can find use for every single shade. No losers here. I'm not crazy about the actual design on the palette since I prefer sleek minimalist packaging but it fits the theme. I do like the round shape which is nice for a change and how sturdy it is. I also appreciate that it has a nice full sized mirror which always useful while also making it easily portable and travel friendly. This is a terrific everyday eyeshadow palette which is pretty much all I need and it has gotten me into wearing eyeshadow more. I think I'm set with this one for awhile. The Tarte Rainforest of the Sea Eyeshadow Palette retails for $36. It is a limited edition product that is still available for purchase from Sephora and Tarte Beauty. What do you think about this palette? Do you have a favorite eyeshadow palette? This post was originally scheduled for Wednesday but since pushed it back and also took a social media timeout in order to support equity, justice and the human rights of women and all gender-oppressed people. This was for the International Women's Strike that was happening for International Women's Day. Learn more about A Day Without Women. I also was not crazy about the palette design but must said the shades are stunning. I feel the same way about eyeshadow palettes, so the only ones I own are gifts or PR samples. I agree that all of th shades look bery wearable, but in the end I wouldnt reach for it either, simply because it is a palette. Such a pretty and wearable palette! Lovely palette and beautiful packaging! I remember the days I used to buy all the e/s palettes I can get my hands on. Now, I'm like you, Rowena. I rarely use them aside from special occasions that I use the same one over and over- the Kevyn Aucoin palette that has the highlight/contour shades as well. I find I can use that for any look. I must say though that this Tarte palette sounds/looks so enticing. I really like the shades....they all look wearable and great to know they're creamy and pigmented enough even without a primer. Imma gonna see if I can find this in my local Sephora. I am an eyeshadow palette addict as you could already tell but Tarte has never interest me as a brand and frankly I can't pin point the reason why. I am also not a fan of Too Faced but at least I have a reason for it; I am not a fan of their almost no-stop collab with YouTubers and releasing too many 'limited editions' but for Tarte, I have no reason. Your swatches are beautiful, I'll need to walk into Sephora and swatched these myself to get the feel of the palette. Oh my heavens I need that!! What a beautiful range of shades! i don't wear eyeshadow often, but would indulge in this as well. I can understand you. Four years without an eye-shadow palette may seem long, but if know that you can do without it, then it makes perfect sense not to be wasteful. Right now I'm using an eyebrow set by essence as both an eye-shadow and eyebrow set...so I don't own a single eye-shadow palette at the moment. For me this eyebrow set seems to be enough. I've never saw sense in buying a lot of eye shadow palettes if we're not going to use them. Some people just wear an eyeliner, for others only mascara will do. Naturally, there are also those people who wear eye-shadow on daily basis and for them it makes sense to own several palettes. It is all a matter of our preference when it comes to eye make up. This neutral palette seems lovely. The swatches are beautiful. 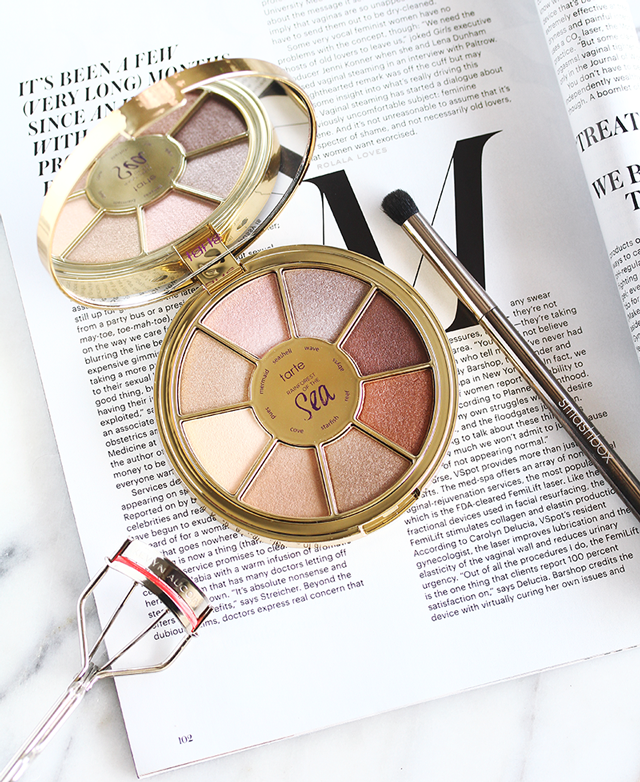 So great that you found an ideal eye-palette for yourself. 8 hours without a primer and longer with a primer is very good durability. The packaging is really cute! It is nice to see a round one for a change. The fact that the packaging is travel friendly, sturdy and comes with a mirror makes it even cooler. So pretty love the shades. Yes the round shape and packaging is a nice change up and the shades look so different on, cooler and more purple not so brown but very pretty. Rowena, the shades look beautiful on you! Tarte always has great sales! 30% off was a great deal. The colors look much better on you than me. I didn't particularly care for it on me (when I reviewed it), but it may just be my hue. I got this palette for Christmas, but I still haven't tried it yet. It looks amazing!